You Could Win this Cobra! The Ohio Cobra Club would like to thank everyone that purchased raffle tickets. The winner of the 2017 London Cobra Show’s Superformance Cobra is Mrs. Jackie S. from Cincinnati, OH. Stay tuned for 2018 show information! Each year, on the weekend following Father's Day, the Ohio Cobra Club hosts the London Cobra Show as a means of raising money for the Cystic Fibrosis Foundation. 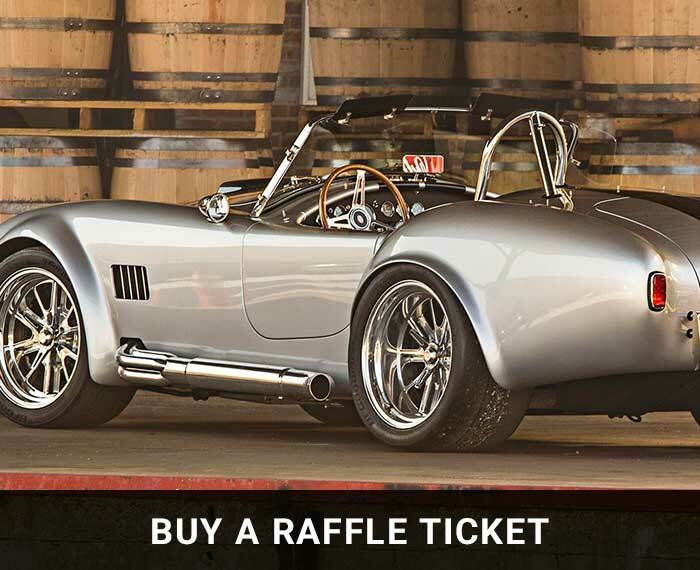 During the months leading up to the show, club members build or purchase a replica of a Shelby Cobra roadster and sell raffle tickets so some lucky person can win the Cobra replica of their dreams. The club sells raffle tickets at various car shows around the country, as well as on-line. 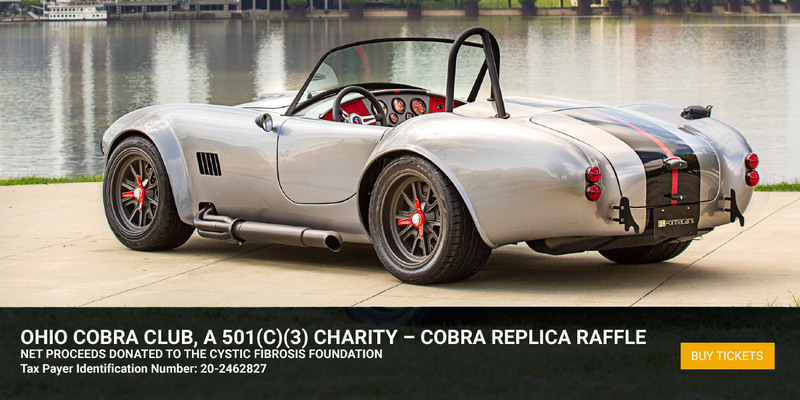 The 2019 London Cobra Show’s raffle car is a modern interpretation of the iconic 1960’s era automotive legend everyone knows simply as a Cobra. 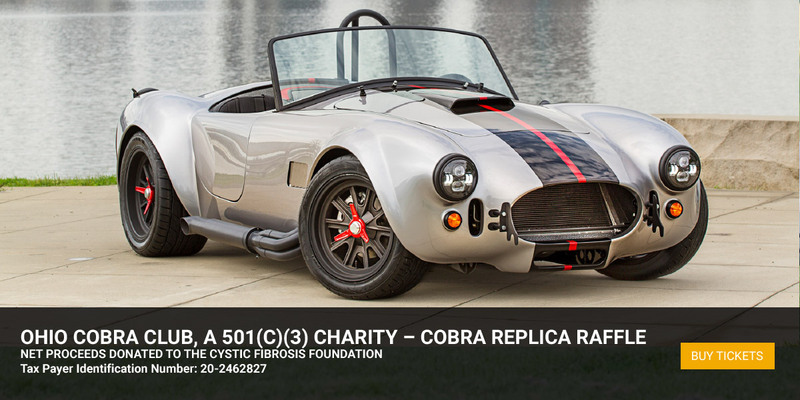 The 2019 raffle car uses modern materials, manufacturing processes and offers the driver the advantage of the latest automotive technologies, such as a Ford Mustang V8 Coyote engine with selectable drive modes that cover a broad range of road conditions. The London Cobra Show is open to 1960’s era Shelby Cobra Roadsters, Daytona Coupes and the Ford GT40, both replicas and originals. If you love Cobras, the London Cobra Show is the place for you, as you will meet a large group of people from varied backgrounds and stories, all having a common bond – a love of these cars. The cars bring everyone together originally, but it is the friendships and shared experiences that bring everyone back year after year. The show’s vendor area is an excellent place for those interested in these automobile replicas to view and learn, as most of the major replica manufacturers will have their products on display. Although the show is called the London Cobra Show, or simply LCS, most of the events will take place in and around the northwestern portion of Columbus, OH. This is due to the lack of adequate lodging in London and a desire to have all LCS attendees stay in a single hotel. For 2019, the host hotel and venue has changed to the Crowne Plaza Columbus-Dublin located at 600 Metro Place North, Dublin, OH 43017. Please see the HOTEL section for information on the Crowne Plaza. Various activities and cruises take place from Thursday through Saturday. On Saturday morning, a Cobra parade into London occurs, beginning at the Speedway Truck Stop near the southwest corner of I-70's exit 79. On Saturday evening, guests will enjoy the Grand Gala in the Crowne Plaza’s ballroom. Please see The Show page for additional information. Please see the sign in the Crowne Plaza’s lobby for directions to the LCS registration room on Thursday and Friday. Late arrivals may register Saturday morning at the Speedway. 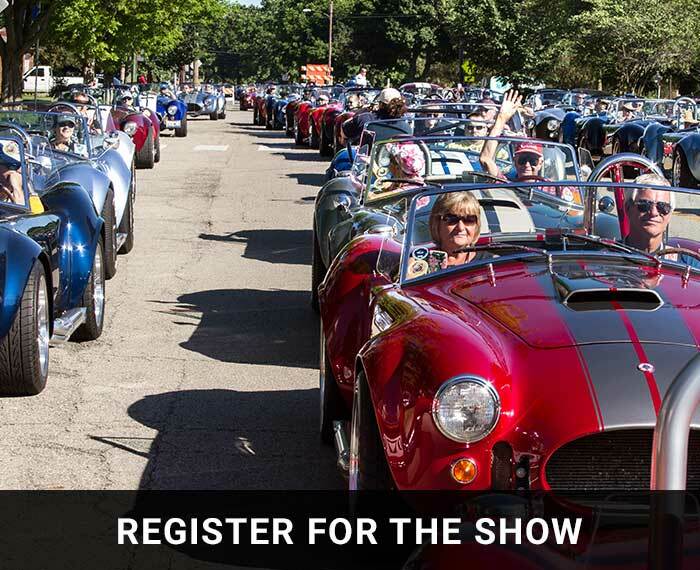 Please see the Show Registration tab for additional information for Cobra owners registering for the show. Vendors should see the Vendors Registration tab for additional vendor information. Shortly after 9:00 am on Saturday morning, the Cobra parade will roar into London. Once the Cobras have been parked and the opening ceremony is completed, visitors will be able, for a $10.00 donation to the Cystic Fibrosis Foundation, take a Cobra charity ride down Main Street - at speeds faster than the speed limit, all with the approval and encouragement of the City of London’s Police Department. While the Cobras are parked on Main Street, visitors are welcome to view the Cobras, speak with the owners and visit the many vendors displaying their products in Gasoline Alley, directly in front of the Madison County courthouse. On hand will be the major manufacturers of "build-it-yourself" component car kits as well as suppliers of “turn key minus” cars that are complete with paint, interior, wheels, and tires less the drivetrain. Also having their products on display will be engine manufacturers, transmission suppliers, and agents for component car insurance, as well suppliers of Cobra and Shelby memorabilia, tee shirts and a Cobra raffle. Main Street south of the courthouse is also closed for londonstrawberryfestival.com which takes place concurrently with the London Cobra Show. The Cystic Fibrosis Foundation was founded in 1955 and at that time very little was known about the Cystic fibrosis (CF) disease – there were no therapies and barely any research. Since cystic fibrosis is what those in the medical profession call an orphan disease, a disease that affects such a small percentage of the world’s population that pharmaceutical companies do not believe they could ever see a profit after spending the large amount of monies that it takes to develop CF medicines. Currently, there are approximately 30,000 individuals in the United States that suffer from CF. 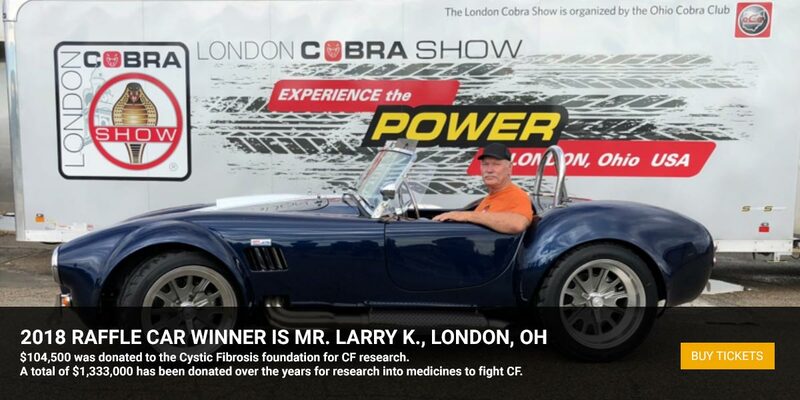 As the Cystic Fibrosis Foundation does not receive any federal funding and is supported strictly by donations, the Ohio Cobra Club is proud to say that as a result of our 2018 London Cobra Show and raffle, we were able to donate $104,500.00 to help fight Cystic Fibrosis. Since 2000, we have donated $1,333,000.00 to the Cystic Fibrosis Foundation, with all of the donations designated ONLY for research into developing medicines for CF. 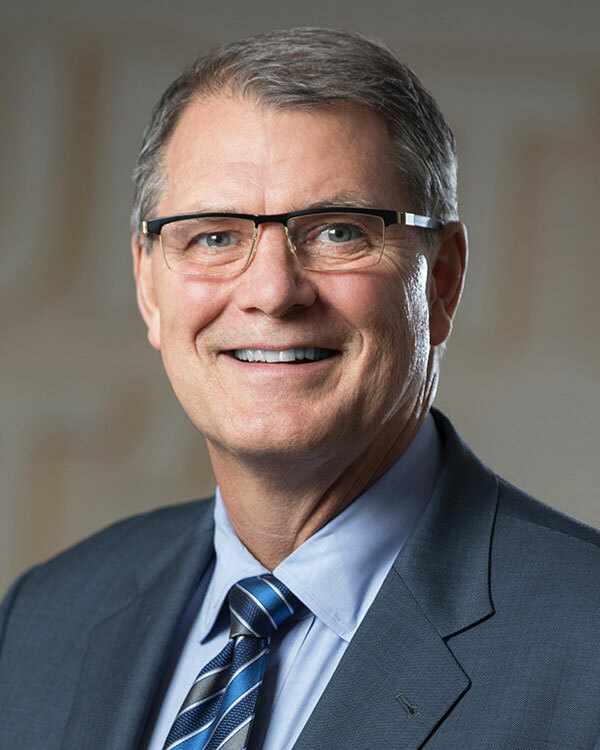 These donations, have in part, helped the Cystic Fibrosis Foundation itself fund the development of 3 cystic fibrosis medicines, Kalydeco, Orkambi, and the recently approved Symdeko. Approximately 60% of the individuals that have CF may now be able to benefit from either Kalydeco (FDA approved in 2012), Orkambi (FDA approved in 2015), or Symdeko (FDA approved in 2018). All three of these cystic fibrosis medicines treat the underlying cause of cystic fibrosis, rather than just symptoms. Everyone that has purchased raffle tickets or participated in our London Cobra Shows should know that they have played a role in the development of these three drugs, each of which improve and extend the lives of those individuals with CF. In 1955 a child born with CF had a life expectancy of around 5 years. Today, thanks to CF research, more than half of those with CF are 18 years or older with the median age of survival now in the 40’s. Individuals with CF are now living longer, healthier lives and pursuing dreams they never before thought possible – things like going to college, having careers, getting married and in some case having children. With your help, the Cystic Fibrosis Foundation is on a mission, within our lifetime, to find a cure for CF and your purchase of raffle tickets will certainly help us help them meet this goal. For additional information on Cystic Fibrosis, please visit www.cff.org. PLEASE HELP US HELP TURN THE DREAM OF A CF CURE INTO A REALITY! 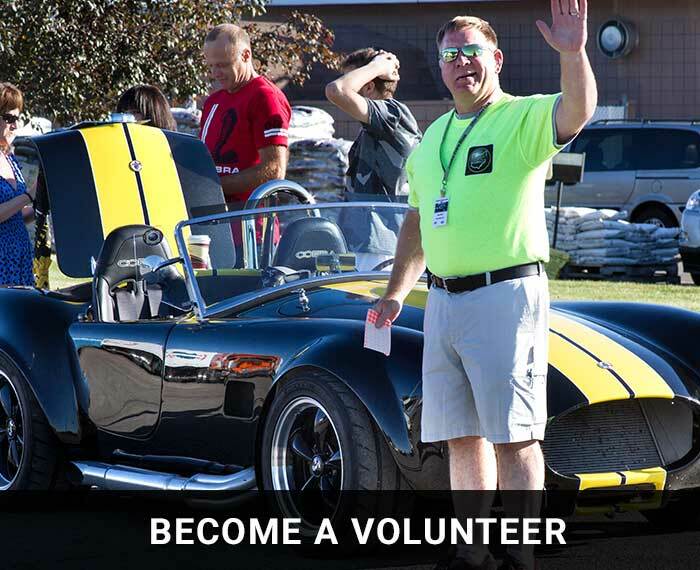 Thanks to the Ohio Cobra Club, a fun-loving group of car enthusiasts with a desire to help those living with cystic fibrosis, the Cystic Fibrosis Foundation has made progress for those living with this disease. For nearly 20 years, the Club has worked tirelessly to raise funds and awareness about CF at their annual London Cobra Show in London, Ohio. Together, they have inspired people from across the country to contribute more than $1.3 million in support of our mission. I would like to express my deep gratitude for this generosity and dedication, which has helped make truly remarkable progress possible. Thank you for making a difference and bringing hope to all people living with cystic fibrosis. Add my e-mail address so I can receive future Constant Contact e-mails on updates on ticket sales, Cystic Fibrosis and the London Cobra Show. Copyright © 2019 - London Cobra Show - Ohio Cobra Club - A 501(c)(3) non-profit organization. London Cobra Show website design by: OmniSpear, Inc.